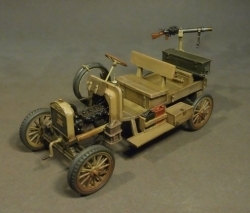 The LCP patrols operated in modified Ford Model T’s armed with Lewis machine guns, had wider tires, radiator condensers, and primitive sun compasses. By a combination of LCP’s, Rolls Royce armoured cars, camel corps, and BE2 aircraft, the British were able to defeat the Senussi. With the end of WW1 the LCP was disbanded, however the lessons were not forgotten. The 1st Light Car Patrol was formed in Melbourne during 1916 as part of the Australian Imperial Force during World War I. 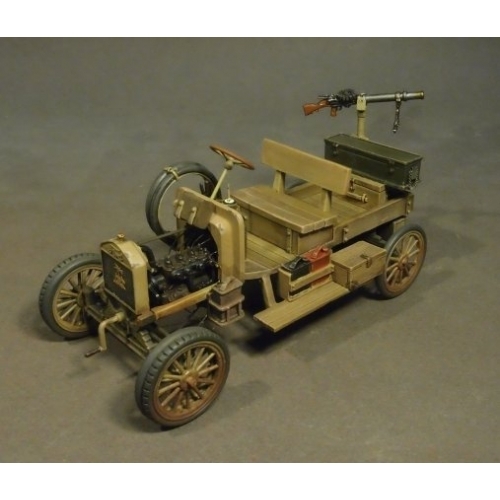 First named the 1st Armoured Car Section, it was also known as the 1st Armoured Car Battery. The unit fought against the Senussi in the Sudan and Western Desert. The 1st Armoured Car Section became the 1st Light Car Patrol on 3 December. 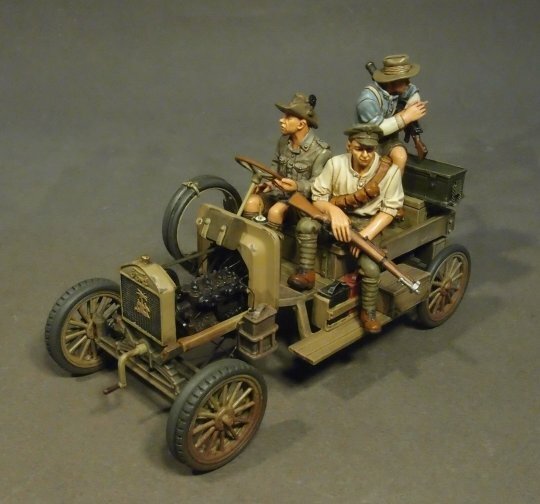 As their original three armoured car vehicles became worn out from hard use in the Western Desert and were irreparable due to shortages of spare parts, the unit was re-equipped with six model T-Ford light cars. The cars were given names: Anzac, Billzac, Osatal, Silent Sue, Imshi and Bung. These were traded in for six new Fords on 11 December 1917. In May 1917 the unit was redeployed to Palestine by rail, and served throughout the campaign there. Like similar British units of the Egyptian Expeditionary Force it was used to conduct long range reconnaissance and patrol duties, often operating well in advance of forward cavalry units. By November 1918 they had reached Aleppo with the British Indian 5th Cavalry Division where they were believed to be the furthest advanced Australian unit at the conclusion of the campaign. The Long Range Desert Group was the brain child of Major Ralph Gagnold, Royal Signal Corps. To understand how the LRDG came about we must go back to 1916. Italy had occupied Lybia in 1911, and although had been at war with the Senussi, an Islamic Religious sect, with Germany’s help they were able to persuade the Senussi to join the fight against the British. The Senussi were expert raiders who could seemingly strike from nowhere and then disappear. Their usual method of attack was on camel back, and the Senussi were better fighters on camel back and they knew the desert well than the British camel mounted regiments which were initially formed to combat the Senussi threat. The senussi camels were however vulnerable to artillery and machine gun fire. But mobility was needed to chase down the raiders. The answer came from the use of armoured cars, specifically the Rolls-Royce, but they could not keep pace with the fast moving camels, and were quick to bog down in the desert. What was needed was a lighter more reliable car, that could move swiftly and carry the additional fire power. This was the modified Ford Model T and gave birth to the Light Car Patrols. Additional figures and vehicles are sold separately. Please note the above price is the US$ price and A$ price will be calculated at time of purchase.